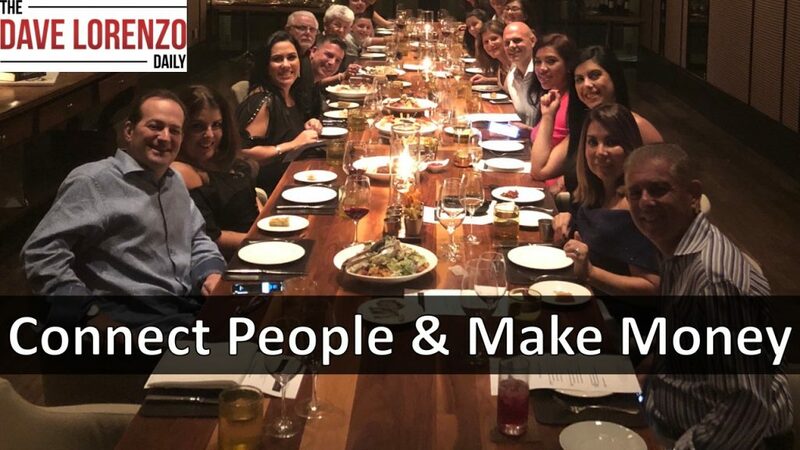 Today’s Dave Lorenzo Daily focuses on connecting people, closing sales and making money. When you host a client appreciation event and that event focuses on connecting people it will also help you with closing sales. A client appreciation event is one during which you bring your clients together and introduce them to each other. You say “thank you” to everyone for doing business with you and they will, in turn, spend the event talking about you and how great you are. Below is a transcript of this video. Please note this is a transcript of the spoken word so it is not the ideal format for reading. It is provided as a guide for you to use with implementation. Get your clients together at an appreciation event and introduce them to one another. Magic will follow. I promise you, if you get your clients together at a client appreciation event, get some beer and wine, some hor d’oeuvres and a light buffet, have it set up in the conference room in your office, clean the place up, invite 50 of your clients over, talk for five minutes and then introduce people to one another, you will create a community of people saying good things about you and your business will grow. You’ll get at least two or three new pieces of business as a result because you’re showing people you appreciate them and you’re introducing them to other people they can do business with. Host a client appreciation event, your business will explode.